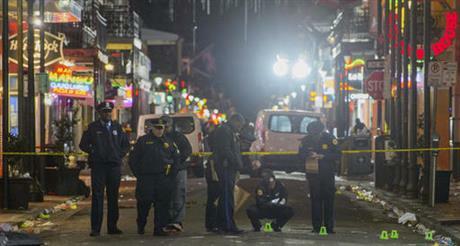 NEW ORLEANS (AP) – New Orleans Police say one man is dead and nine others injured following a shooting in the French Quarter. Police Superintendent Michael Harrison said during a news conference that officers responded about 1:30 a.m. Sunday to the shooting at the intersection of Iberville and Bourbon streets. Harrison said the shooting victims whose ages ranged from 20 to 37 included two females and eight males. One male victim died at a hospital. Harrison said police do not know what motivated the shooting, but one male victim was among two men arrested on firearms charges. Harrison said the shooting happened despite an increased police presence for the Bayou Classic football game Saturday night between Southern and Grambling universities.